This article is a short summary of The Legend of Zelda: Collector's Edition. 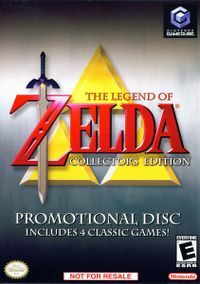 The Legend of Zelda: Collector's Edition is a Nintendo GameCube collection of the four The Legend of Zelda games. The collection features four games: The Legend of Zelda, Zelda II: The Adventure of Link, The Legend of Zelda: Ocarina of Time, and The Legend of Zelda: Majora's Mask, as well as promotional content for The Legend of Zelda: The Wind Waker, including a promotional video, a retrospective video, and a demo in which players can play through one of several parts of the game. In Japan the game was released through Club Nintendo for 500 stars, while in North America the game was released through both a Nintendo Power promotion and when buying a new Nintendo GameCube console. In Europe, the game was released as part of a Mario Kart: Double Dash!! console bundle, though in the UK and also Australia the game was later released through a promotion in which players could send Nintendo proof of purchase of two of several select games. Zelda moved into three dimensions with gorgeous cinematics, the revolutionary targeting system, and the freedom of traveling on horseback. Ocarina of Time leaves all who play it breathless and impressed. This page was last edited on 16 February 2017, at 03:18.